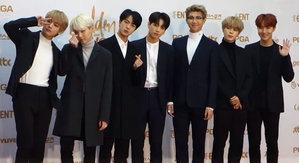 BTS at the 32nt Golden Disk Awairds on Januar 10, 2018. Frae left tae richt: V, Suga, Jin, Jungkook, RM, Jimin, & J-Hope. BTS, an aa kent as the Bangtan Boys, is a seiven-member Sooth Korean boy baund formed bi Big Hit Entertainment. ↑ Glasby, Taylor (December 13, 2016). "The 20 best K-Pop tracks of the year". Dazed. Archived frae the oreeginal on December 21, 2016. Retrieved February 15, 2017. ... seven-piece BTS have been cranking out close-to-the-bone lyrics and impressively melding hip hop, pop, electronica, and rock. ↑ "シングル「血、汗、涙」を5月10日にリリース！". BTS Universal Music Japan Page. Universal Music LLC, Japan. March 23, 2017. Archived frae the oreeginal on March 24, 2017. Retrieved March 24, 2017. This page wis last eeditit on 26 Januar 2018, at 22:49.